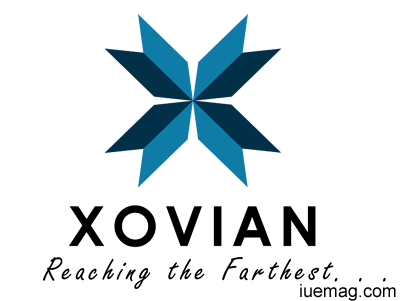 Xovian is an organization that invites the involvement of people from any field with all types of genuine innovative ideas from various fields, i.e. Science, Commerce, Humanities, etc. We accept proposals from school students to college graduates, young aspirants to old aged people, etc. regardless of their qualification, background, occupation, level of study, etc. We acknowledge and thus, encourage the emerging aspirants of their respective field(s) and provide all necessary possible assistance (in any form) to build and develop their idea depending on the calibre for the betterment of the humankind. It aims at spreading awareness about the latest concepts and market trends among the people, specially youth and students, living in villages and towns. To acknowledge and encourage each and every innovator regardless of its background, qualification, field, status, etc. and serve better to humankind by advancing and promulgating knowledge and implementing/altering the parameters of life across the globe in an incredible manner. Our team is conducting innovative and creative workshops to aware the students about latest technologies followed by motivational, inspiration and technical lectures. We have a team of dynamic young engineers, researchers and technocrats. Our team members are recognized and appreciated globally by prestigious organizations like NASA, ISRO, IEEE, JAXA, ESA, AIAA, IAF, TUM and many more. The workshop is a first -of- its- kind to be organized in India. It aims to equip basic embedded knowledge on micro-satellite design to engineering college students. The workshop will teach the basics of what a satellite is and how micro-satellites can be designed using the basics of electronics and micro-controller programming. Although similar workshops exist for other fields of engineering (robots, radio-control airplanes, racing cars, etc. ), there is no such workshop in INDIA which relates space system design with electronics. We promise to give students the satisfaction of being involved with the end-to-end life cycle of a complex engineering project, from conceptual design, through integration and test, actual operation of the system and concluding with a post-mission summary and debrief. This workshop will fulfill all this and we hope much more, as our motivation is to aspire and inspire! The mission of the competition in workshop would be to design a satellite that will fit inside a Jam - Jar and will collect information of about 511 packets spread across a time interval of 10 minutes. The information that it will collect would be dependent on its direction and location of movement during its descent after the launch of the CanSat. Why organzie Satellite workshop on your campus? 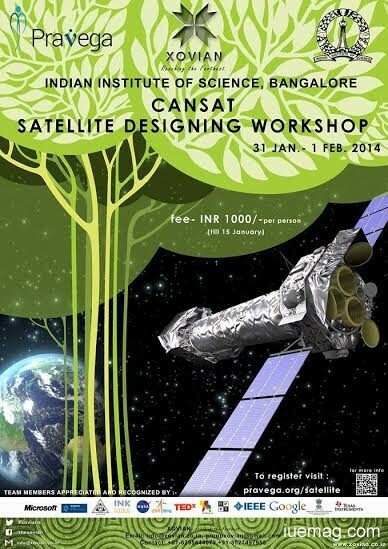 Satellite Designing and Launching workshop at Indian Institute Of Science on 31st Jan 2014. The New Year 2014 has brought a small surprise packet for the technology lovers! The Indian Institute of Space Science, Bangalore in association with XOVIAN is organizing a workshop on CAN Satellite-Designing and Launching at Pravega'14. The 2 days' workshop will be conducted on 31st Jan-1st Feb 2014 at IISC premises. Participants will get a unique opportunity to learn about the designing and launching of a microsatellite using the basics of electronics and micro controller programming with their own firsthand experience. The workshop emphasizes on bringing together the theoretical knowledge and its practicality in the field of space system design and electronics. Participations are encouraged from all the technology enthusiasts irrespective of their fields. This workshop is open for anyone. Any facts, figures or references stated here are made by the author & don't reflect the endorsement of iU at all times unless otherwise drafted by official staff at iU. This article was first published here on 28th December 2013.